Thinking of buying new sails this year? If you are thinking of buying new sails over the winter, make sure your sailmaker has the latest Dragon logo and knows the rules on placement and letter size. This is in Section 9 of the Dragon Class Rules. An except is here. And don't forget, most sailmakers offer discounts in the autumn. Vancouver Fleet held their AGM this week. The racing schedule for next year looks busier than usual, with two special events, the Pacific Rim Interport and NOOD Seattle. The Interport rotates between four yacht clubs on the Pacific Rim (RSYS, Kansai, RHKYC and RVYC) and 2015 is the year for the Royal Vancouver YC to host. Dates have not been decided yet, but it looks likely to be in September. And on May 15-17, the Vancouver Fleet plans to travel to Seattle to join Seattle area Dragons at NOOD Seattle. The six metre fleet is often at NOOD, so it will be great to see the similar lines of the Dragons on Shilshole Bay. Do you have any old Dragon documents? We recently received IDA and AIDA documents from the 70s and 90s, including Fleet lists and newsletters. Contact us for a link to download these. And if you have any old Dragon documents in your files, let us know what you have - we are trying to archive as much as possible. If you are looking for a present for that special Dragon sailor, there are lots of options. See the NA Dragons Merchandise page for ideas. 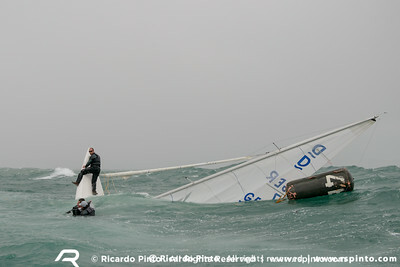 A Dragon sank in the first Winter Series at Cascais. Reports from people in the race say it happened during a squall, with gusts up to 35 knots. The boat did an uncontrolledd gybe, the spinnaker ended up dragging in the water and it sank stern down in about 2 minutes. Helm and crew were quickly picked up and all are fine. There are plans to try to recover the Dragon (which sunk in 25 metres of water) and find out more about the sinking. For more photos by Ricardo Pinto, check the Forum. And let's be careful out there.